From Associate Professor to small business owner! In RiderPilates, I combine my lifelong interests in horseback riding and how the human body functions in one pursuit. I grew up riding horses with a local Pony Club. I was a typical horse-crazy kid; all free time was spent with my pony or horse. But then realities of “growing up” appeared, and I was off to college, and then some. 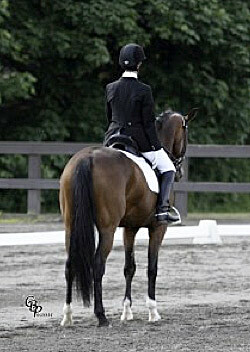 Horses worked their way back into my life when I got my first job, and I became a student of dressage. My first career was in medicine, specifically Anesthesiology, specializing in Obstetric Anesthesia. (see “Beth’s Medical Career” further down the page for more on this phase of my life). I worked hard to accomplish many goals in academic medicine, but my body paid a price. In 1996 I had my first of two herniated lumbar discs (ouch!) that eventually required surgery. The pain of this condition brought my life into focus – I was not happy, I made some changes, and I left medicine. It was clear that I needed an ongoing fitness program to keep my back healthy, and to keep me riding dressage. I tried pilates, and was immediately taken by its precision, attention to detail and possibilities for movement education. Plus, I enjoyed my best dressage rides after my pilates sessions. I was hooked! I took the course work and became a certified pilates instructor through the PhysicalMind Institute, as well as the Pilates Method Alliance. I run my business out of my house, and offer both private machine-based sessions as well as small group classes. 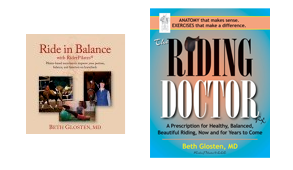 After several years, I expanded my pilates teaching into the riding arena by giving rider position-focused lessons using pilates images and breathing techniques. RiderPilates was born. Lessons and clinics are designed to improve rider posture and balance on horseback helping the rider move with the horse in harmony. I am interested in using pilates to enhance riding skills. As well, I find pilates very useful as a bridge between physical therapy and “normal life” in those healing from injuries. I strive to teach the movement principles of pilates in such a way that they are relevant outside the studio and can improve day-to-day function, reduce pain, and enhance performance in any sport. I have other pursuits, as well. I am fascinated with Buddhist philosophy and how mindfulness and meditation can improve quality of life. I love to cook and am interested in many aspects of the food world. I enjoy growing my own vegetables and I enjoy understanding the “how” of foods we have around us – I have made wine and cheese and vinegar. I am interested in food politics and am sad to see price and convenience trump quality, flavor and healthfulness in the food choices of our culture. I enjoy traveling – and the food of new cultures is a large focus of my experience. Beth is between horses right now. She spent many years riding the 2004 Oldenburg mare Donner Girl (“DG”) by Don Gregory. And she said good-bye to Bluette, her 1992 Danish Grand Prix mare, in January, 2018 (see blog post). We’ll see what the next phase of riding entails…. 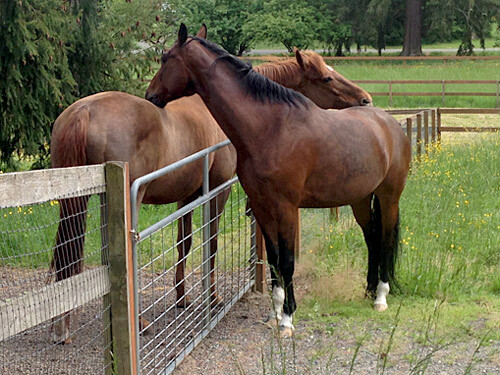 Beth grew up riding with the Bainbridge Island Pony Club, earning her “B” rating. After many years of school, she eventually returned to riding, focusing on dressage. 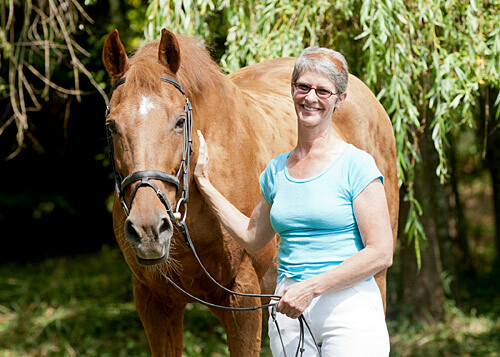 Beth has trained regularly with Roxanne Christenson and has ridden in clinics with the late Dietrich von Hopfgarten, Stephan Kiesewetter, Leslie Reid, Steffen Peters, Henk Glynn, Gerd Heuschmann, and Conrad Schumacher. Beth has been active with Equestrians’ Institute for years, serving on its board as Dressage Director from 2000-2002. 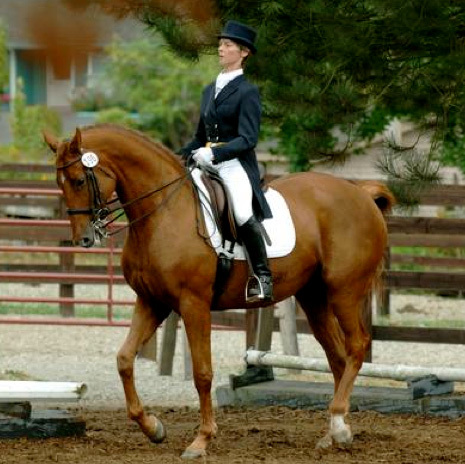 In 2009, Beth traveled to The Netherlands and Denmark to shop for a new dressage partner. After a wonderful whirlwind trip trying 16 horses, she settled on Donner Girl. Why? She fit all the criteria – age, price, size, gait quality – and of all the horses, DG had the most agreeable and cooperative temperament. She tried to listen! While only 5 when purchased, her training was more that of a 4 year old, as DG had already had a foal! Keep up with DG’s training journeys on Beth’s blog. Beth graduated from the University of Washington School of Medicine in 1983. She did an internship in Obstetrics and Gynecology at the University of Chicago, and then changed into their residency program in Anesthesiology. She did a fellowship in Obstetric Anesthesia at the University of California, San Francisco, in 1986. Beth returned to the University of Chicago and worked as Assistant Professor of Anesthesiology for 4 years. She then moved back to her home region, the Pacific Northwest, in 1992, where she joined the faculty at the University of Washington, and earned the rank of Associate Professor in 1996. Her academic accomplishments include: 94 presentations at professional meetings, 37 published abstracts of original research, 18 peer reviewed journal articles of original research, 9 review articles, 6 book chapters, and position of Senior Editor for the journal “Anesthesia and Analgesia” from 1994 – 1998. Personal and health issues prompted Beth to leave medical practice in 1997.